Where σcc = Permissible stress in concrete in direct compression. Ac = (A-Asc) Net cross-sectional area of concrete excluding any finishing material and reinforcing steel. σsc = Permissible compressive stress for column bars. Asc = Cross-sectional area of longitudinal steel. P = Safe load carrying capacity of the column. These columns are reinforced with closely and uniformly spaced spiral reinforcement in addition to longitudinal steel. These columns are also known as circular columns and are generally spirally reinforced. Sometimes, individual loops may be used instead of spirals. Columns having helical reinforcement shall have minimum 6 longitudinal bars. For columns with helical reinforcement, the permissible load satisfying the requirements shall be adopted as 1.05 times the permissible load of a similar member of lateral ties. Where Ag = Gross area of the section. Ac = Area of the core of the helically reinforced column which is measured to the outside diameter of the helix. fck = Characteristic compressive strength of concrete. 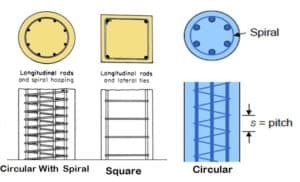 Helical reinforcement should be in the regular form having the turns of the helix evenly spaced and the ends should be anchored accurately by giving one and half extra turns of the spiral bar. The pitch of the helical turns shall not be greater than 75 mm, nor more than 1/6th of the core diameter of the core diameter of the column. nor less than 25 mm, nor less than three times the diameter of the steel bar forming the helix. The diameter of the helical reinforcement shall be not less than 1/4th the diameter of the largest longitudinal bars and in no case less than 5 mm. When the ratio of the effective length and the least lateral dimension of a column exceeds 12, the column will be considered as long column. In the design of such columns considering the factor of buckling, lower value of working stresses in steel and concrete is adopted, by multiplying the general working stresses by the reduction coefficient Cr. Safe stress in steel = Cr × Corresponding safe stress for short column. Where Cr = Reduction coefficient. lef = Effective length of the column. rmin = Least radius of gyration. So nice and thanks alot for engineering scences and sharing that I can learn from it. Very nice technical information -especially useful for field engineers ..